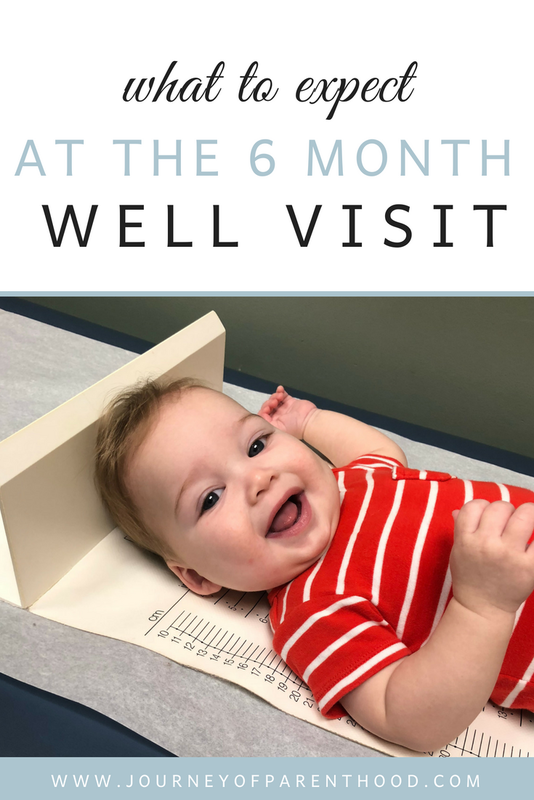 Spear had his 6 month well check-up on June 26th. Our appointment was the first one of the day and yet we were there for almost a full two hours. 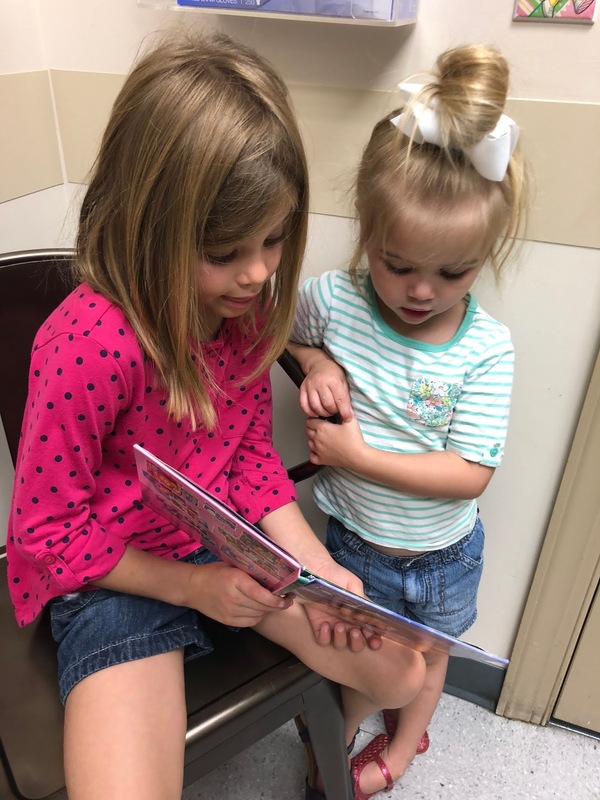 I have always LOVED our pediatrician but yall. That’s crazy! Zach was at the appointment since Spear had shots and we had ALL four kids there since it’s summer. 2 hours for the first appointment of the day is just way too long to be waiting! Thankfully we have sweet babies who all did SO well with the wait and entertained themselves and each other. We did end up asking if they could give Spear his shots early since Zach really needed to leave! I had a couple concerns to discuss at this visit (more on that in a moment) but I wasn’t the least concerned about his stats. People always comment on how chunky he is! So I feel like he looks healthy and seems to be growing just fine for his age. Clearly he dropped a bit across the board in his percentages. Which I don’t personally take a TON of stock in. Kids grow at different rates. Many variables are at play (including the fact that a nurse is measuring a wiggling baby!). I remember with Britt at an appointment they had concerns that she dropped in her weight percentage but I just kept doing what I was doing and she picked back up just fine at the next visit. I wasn’t concerned when she told me her dropped in the height percentage (both his birth parents are short) or the weight (he’s much more active now so that makes sense to me). But the head was odd. To go from 25th percentile to 6th is a big drop! Even when she told me the stats, I wasn’t concerned. At least until she said she has concerns. She said it could be a genetic thing. But that if he wasn’t doing so well in hitting his milestones that with this sort of drop in head circumference she’d usually order a CT Scan just to rule out any neurological concerns. Um. Say what? There is literally NOTHING I can do his head size. It’s completely and totally out of my control. The upside of all of Zach’s health stuff and MS diagnosis is that it’s helped me to let go a bit of the worrying over things I can’t control. Am I concerned? Of course. Am I praying? Most defiantly. But I’m not losing sleep over it either. Spear is healthy. He’s thriving. He’s hitting those milestones. I’ve NEVER been more thankful for a baby hitting the milestones as I am with him. I feel like every time he does something new that it’s a reminder from the Lord that he’s healthy. 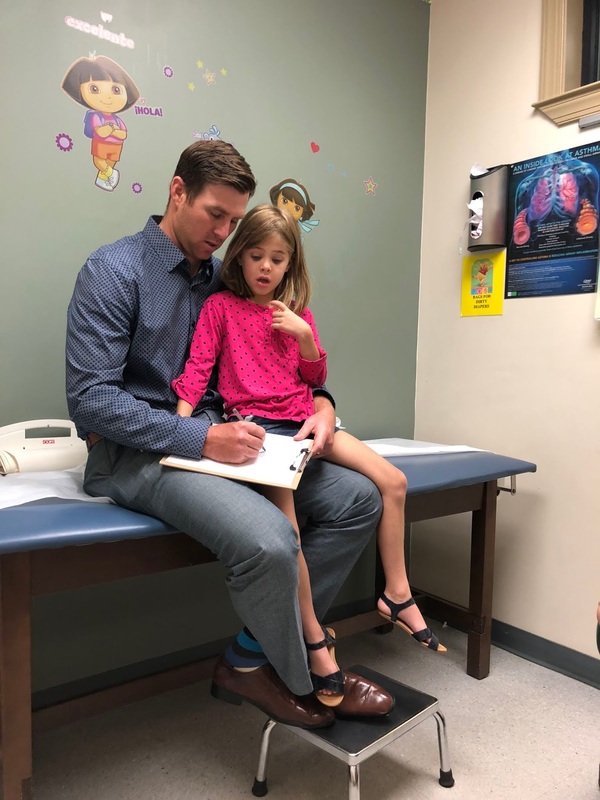 She did remeasure his head size to make sure and said that it’s something we will continue to monitor and that at his next visit we will have a clearer idea if there are any further tests needed. She also mentioned his weight drop and said she wanted me to up his bottle amounts. Up until this visit I’d been doing four feedings a day. 6 oz of formula at 7 and 11, 8 oz breastmilk at 3 and then 8 oz formula at 7 before bed. She told me to make all of the bottles 8 oz. So I did it. And yall it was a nightmare. Spear started taking forever to finish his bottles. He never seemed hungry. And I just didn’t feel like it was what was best for him. So I ended up trying it for a few weeks (long enough to say I did legit try it) then I went back to what we had been doing. I feel very confident that his weight is FINE. I have a good bit of opinions regarding the push for weight gain in infants and children…I won’t go into all my thoughts on that but I don’t think Spear “needs” extra calories in his diet. 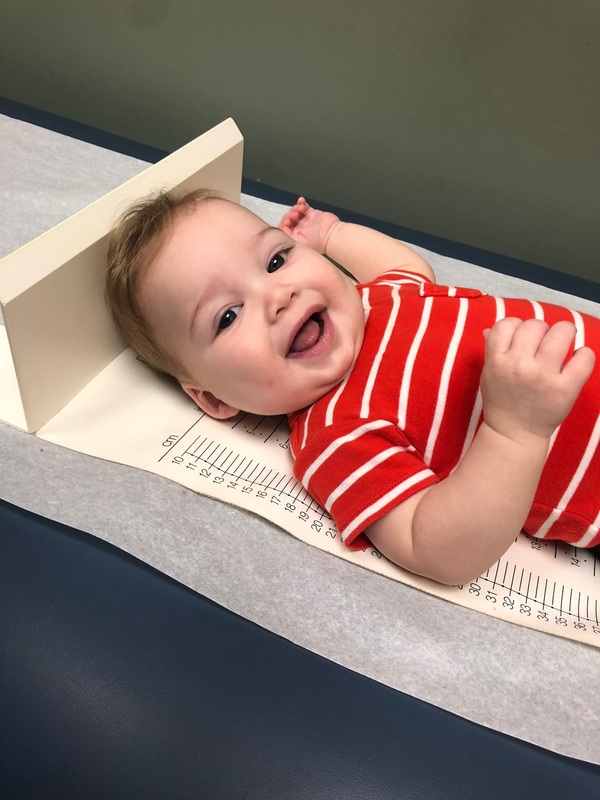 Tess: 26 3/4 inches long which is the 85th percentile. She was also 14 lbs 8 oz which is the 25th percentile. Her head was 16.5 inches which is the 20th percentile. Britt: 17.3 lbs (55th percentile), 27 inches long (50th percentile), 16.5 inch head circumference (24th percentile). And see? Comparing all of these makes me even more confused. Why is Spear’s head size larger than Tess’s was yet is SO MUCH LOWER in percentage?!?! I just don’t trust it yall! This was actually the appointment where Britt dropped across the board as well and where they were a bit concerned regarding her weight gain. I talked a good bit about it all in her post! 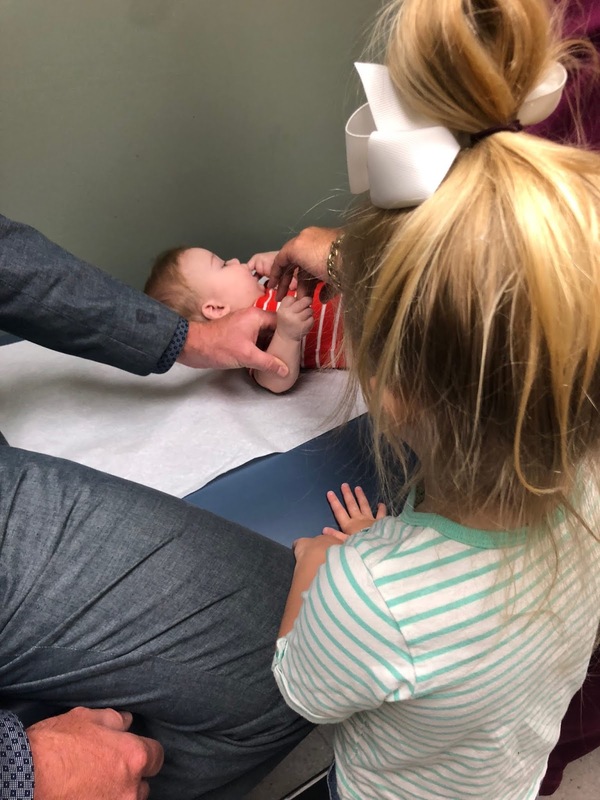 Sweetest sister helping him calm down for his check up! 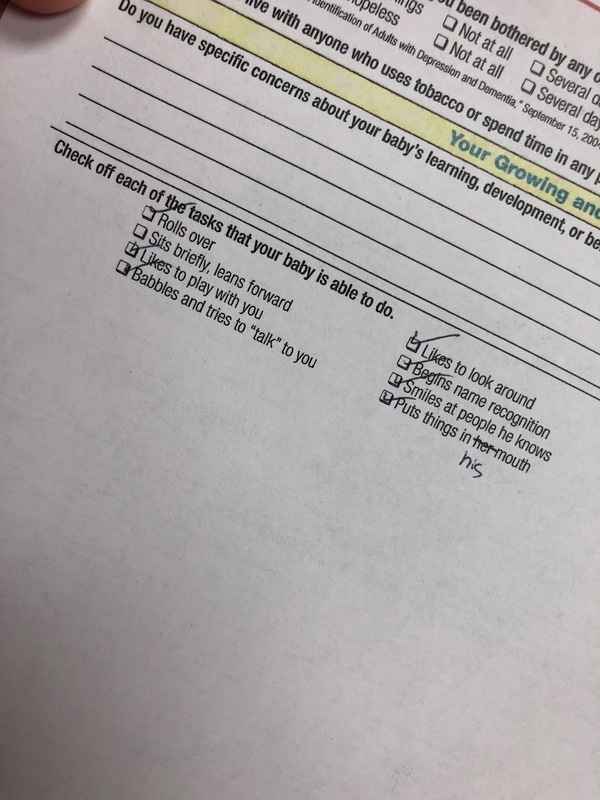 While we waited we filled out paperwork that goes over milestones for this age. Spear is doing GREAT but I was concerned about is inability to sit, even tripod sitting. I felt like that this age it’s something he really should be able to do. 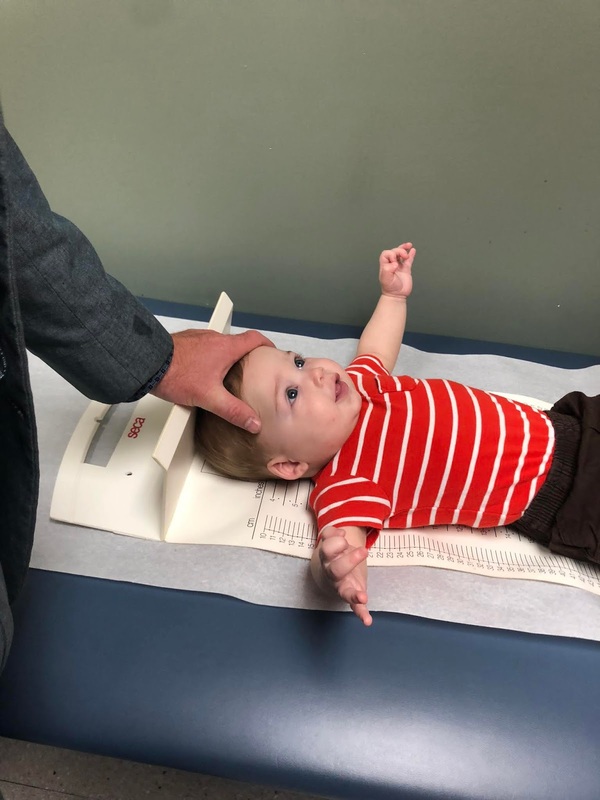 We discussed it with the pediatrician and she said it’s something to be mindful of. She checked over all of his muscles and had him do a few things with her to see how he did and she said he looked great and that sometimes babies just take longer for certain things. Like with Spear he gets up on all fours and is acting like he’s about to CRAWL yet isn’t sitting! It’s strange but also normal for some babies to do things out of order. 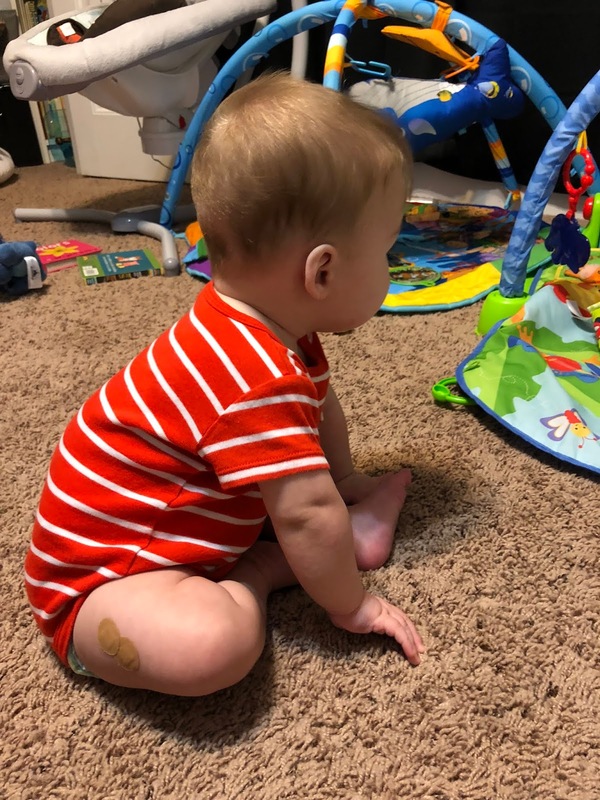 She said by his next well check (at nine months old) she wants to see that he can sit unsupported but also go from laying to sitting on his own. We also talked about his skin as he has a rash on his hand and tends to have them on his cheeks too. She said it’s very normal for a thumb sucker and is from all the salvia and since he sleeps on his belly that salvia sits against his cheeks too. She prescribed an ointment to use a couple times a day to help. Overall it was a bit of a bummer appointment. Spear did SO great and even did well for his shots but I just hate leaving a dr visit with concerns on my heart and the combo of his head stats and sitting concerns did have me worried. I used to wonder if I’d favor the youngest child…especially being that his journey to enter our family was so different. I don’t think I favor him…but I do WORRY the most about him. Which is weird for a fourth baby to be worried and I know that stems from adoption more than anything else. Next Post 10th Blogging Anniversary Celebration – Disney Giveaway! Great job, Spear!!!! I can't believe 2 hours for the first appointment. Ugh, that's frustrating but glad all the kiddos did well.